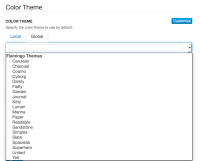 Create a new page/wiki and set a different theme than the default one. If you change your mind, you cannot revert to default / inherited value. This issue affect both ColorThemes and IconThemes.